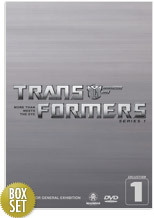 With the latest Transformers live action movie just around the corner, Madman have collected the first season of the original cartoon series on DVD. Originally released in the 1980’s which spawned a variety of clones from The Mighty Go-Bots to Voltron, the Transformer was a truly inspiration cartoon series that told the tale of two ancient species of robots, the law abiding Autobots and the nefarious Decepticons who have been waging war against each other for centuries. Although their home planet has been devastated, the war moves onto planet Earth and this is where the series begins with the humans joining the Autobots to remove the Decepticons from their planet. With over the top action, gigantic robots that can transform into a variety of vehicles from cars to trucks and planes, this was the cartoon to watch in the 80’s and thankfully Madman are now releasing this for the wider audience. The first episode sets the scene for both the Autobots and Decepticons as a deadly space battle takes place aboard the Autobots ship. As all hell breaks out between both fragments of the Transformers and the ship is severely damaged which unfortunately for man, crashes on our little blue planet. The first episode also introduces some of the supporting cast who are also seen in the latest movie and as the Autobots join forces with the humans with the Decepticons deciding to steal the resources of this planet. Episodes 2 to 3 continue with the original story from the first episode which establishes a base for both the Autobots and Decepticons on Earth that involve guile and stealth from the Autobots to save their new homeworld. The main characters in the series include Optimus Prime, Bumblebee, Spike, Starscream, Hound and Skyfire, each with their own different personalities and transformer “powers” and it’s easy to see how this series became so popular. New characters are introduced as the series progresses, including human characters, however the star of the series are the Transformers and some of the battles are quite epic as they each attempt to overpower each other. My favourite episode is about mid season when the Decepticons uncover an ancient Transformer who has been buried in the North Pole and when they revive him, his name is Skyfire. Skyfire comes up with an ingenious plan to defeat the Autobots… of course, it generally always fails. Apart from cars, trucks, helicopters and the like, there’s even some Dinobots in the series which helps point the story in a new direction and of course created a wealth of new toys to the market. Eventually, this current season finishes with Episode 16 which contains one of the most memorable battles from the entire series as Megatron has somehow transferred all the powers of the Decepticons to him in order to challenge Prime. After a massive and truly epic battle, Prime loses… and the series abruptly finishes with the Autobots leaving Earth… of course until Season 2. Although the animation is a little dated, this is still one of the most impressive cartoons from the 1980’s that spawned a whole new world of fascination and if you’re a fan of the series or wish your children to enjoy the TV shows of yesterday, than this is the DVD collection for you and them. Brilliantly entertaining!